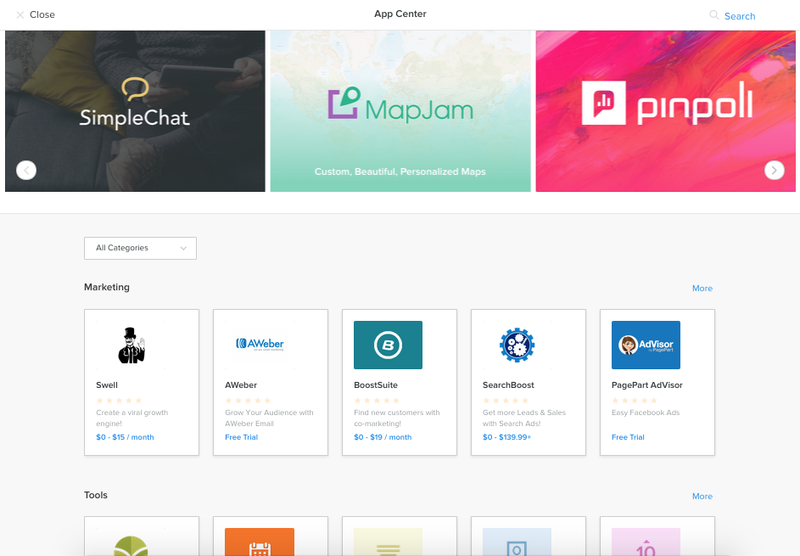 Home » Website Building » Weebly » How to Connect App Center Apps to Weebly Site? How to Connect App Center Apps to Weebly Site? As part of Carbon upgrade, Weebly introduced a marketplace called “App Center” to enable third parties to sell their apps formally on Weebly platform. This opens up an opportunity for developers and companies who sell Weebly products to compete in a single marketplace. As a start Weebly introduced many third party apps and nine free Weebly elements in the app center. 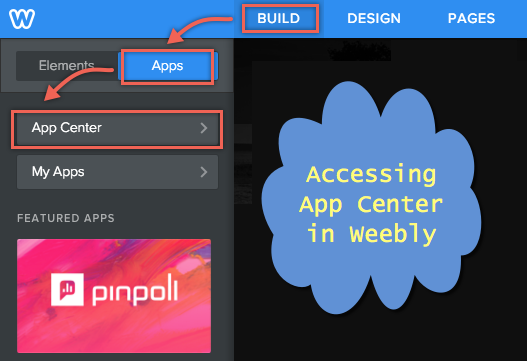 In this article we will discuss step by step tutorial on how to connect app center apps to Weebly site to make use of the free elements. When you are on the Weebly editor, navigate to “Apps > App Center” under “Build” tab to open App Center in an overlaying window. Developers and third party companies should go through Weebly’s review process and the approved apps then will be available in the app center for all Weebly users. The app can be free or priced as decided by the app owner and a Weebly user needs to connect the app to each site independently. The connected apps can be dragged and dropped like other elements wherever you want on the desired page. How to Connect App Center Element to Weebly Site? 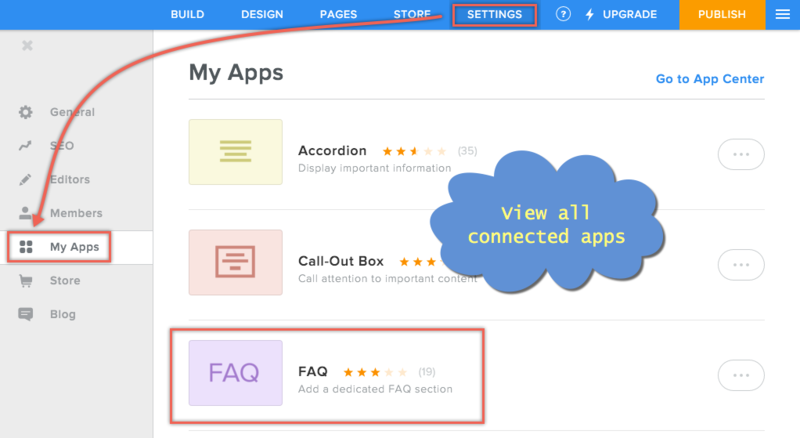 Let us take an example of the FAQ app, freely offered by Weebly. Navigate to App Center and click on the “more” option available against “Communication” category to view all the apps and then click on “FAQ” app. Now you can view the app description and the reviews entered by the users. Click on the “Add” button to connect the app to your site. On the popup window, click on “connect” link to connect the app to your site. The screen will refresh and you will be taken to the home page of your site. You can also view all the connected elements by navigating to “Build > Apps > My Apps” which will be taking you to “Settings > My Apps”. The apps can be disconnected anytime from your site without affecting the active content. For example, when you disconnect the FAQ element, the FAQ content available on your site will still be available. The concept of Weebly App Center is most needed for future development of Weebly platform. Unfortunately the way it is implemented caused lot of confusion among users. None of the apps offered at this moment are bugs free making the apps unusable. Since the app content is available even after deactivating the app, we are not sure how this will work for the paid apps on subscription basis. Hope Weebly guys work fast and keep the platform easy to use which is one of the major reason people want to build site with Weebly.